The look of stone has always been admired in landscape and building design. When choosing materials for a project, some people wonder about manufactured stone vs. natural stone and which is the better choice. There are several factors you should consider when deciding between these two materials. First, what are the definitions of natural stone and manufactured stone? Natural stone is just what it sounds like—stone made by nature that is quarried and cut into various shapes for different uses. 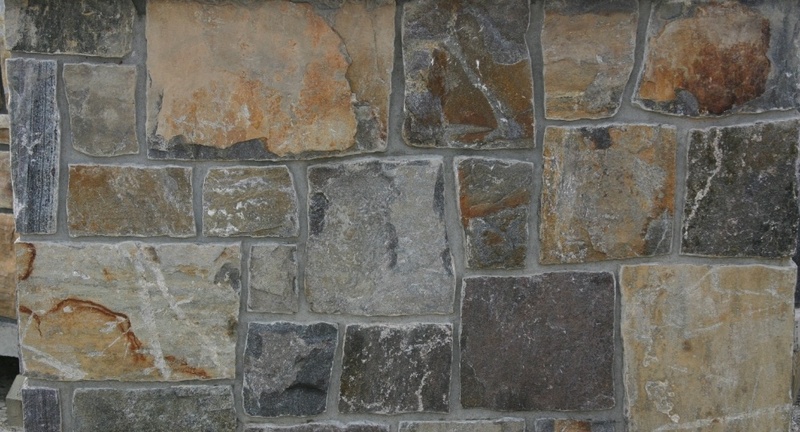 Manufactured stone (also known as cultured stone or manmade stone) is a mixture of cement and other components that is poured into a mold and colored to look like real stone. The popularity of manufactured stone veneers has grown exponentially in the past several years as people have realized that they can achieve the look and feel of real stone at a lower cost. In the past, people often selected manufactured stone veneers because they were lighter in weight than natural stone, which meant they could be used in a wider range of applications. In response to the popularity of cultured stone veneers, the natural stone market developed a process for cutting thinner stone to produce a similar product. Today, a product can be considered a thin veneer if it weighs less than 13 pounds per square foot, no matter whether it is natural or manufactured. Still, the nature of the project and the experience of the contractors involved will help determine whether natural stone or manufactured stone is warranted as the material of choice. One example of application affecting the recommended material is when the project is outdoors. While natural stone can be buried within the landscape, cultured stone should be installed a minimum of 4” above the soil. If the cultured stone is being applied over a concrete surface, it should be installed 2” above the ground. The reason for this is because manufactured stone has the potential of wicking up moisture. The moisture can get trapped within the product, and when the freeze-thaw cycle begins, cracking can occur. A professional can recommend a material for any specific application. For most people, price is the number one driving factor in their decision-making process. There can be quite a price difference between manufactured stone and natural stone, depending on the manufacturer, the type of material, the amount of material needed, and the freight costs. While manufactured stone is typically less expensive than natural stone, there are exceptions. A high-end manufactured stone is likely to be comparable in price to a low-end natural stone. Another factor that can potentially affect final cost is the installation itself. When working with natural stone, many people choose to hire a mason to install it for them. Masons have the skills and artistic perspective to work with the stone the way it was intended to produce the best results possible. Overall, there isn’t much of a visual difference between manufactured stone and natural stone. Both come in a wide variety of shapes and colors to produce a limitless range of aesthetic options. Many people prefer the timeless, natural look of real stone, especially when it is chosen and installed to look like it’s always been a part of the landscape or the building. On the other side of the coin, manufactured stone has come a long way since it first began to be produced in the mid-20th century. Today’s manmade stone manufacturers use molds cast from real stones and hand-coloring techniques that can provide a detailed, realistic look. One difference that may impact the buyer’s decision has to do with the properties of the material itself. True stone can be cut, and then the edge can be artistically chiseled and carved by a mason to retain its natural appearance. Cutting cultured stone, however, exposes the aggregate edge, which can’t be chiseled away to look natural. There are ways of hiding this edge in many applications, so the decision comes down to personal preference. When properly installed, manufactured stone should hold up just as long as natural stone does against weathering and time. However, it may not retain its original color over the course of many years as well as natural stone. Mineral oxide coloring is applied to the surface of the product during the manufacturing process, and after many years of weathering the color may fade, changing the stone’s appearance.